Car and Drivers "Time Attack". Virginia International Raceway (VIR) has been used as their standard for the last three years. However equipped, the GT-R is certainly quick—its 2:55.6 lap time bettered last year’s Corvette Z06 by more than two seconds—if not the most rewarding car to drive fast on a track. car and driver is terrable and i will never read the magazine again. 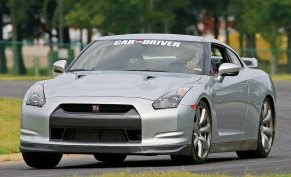 :( i dont care what they say about the R35 good or bad. Car and Driver is the worst car mag going. Hopelessly biased. They don't use proffessional drivers as if their editors are good enough.